Parenting teaches you a lot about yourself, doesn’t it? 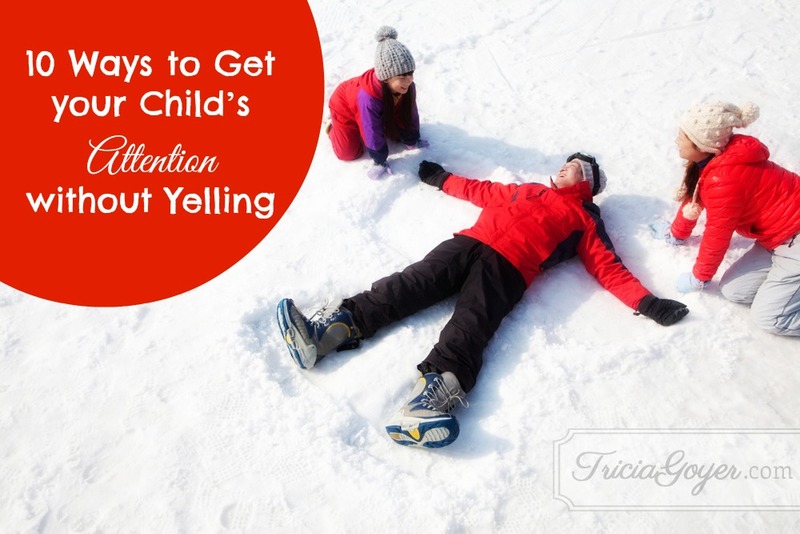 You’ve probably been tempted to scream at your kids more times than you’d care to admit. You’re not alone. Have you ever heard the “wah wah wah wah” of Charlie Brown’s teacher come out of your mouth? Have you ever wanted to jump on the table and yell to the rafters? Have you ever heard yourself say, “Why won’t you listen to me?” This list is for you. Use these ideas to get your child’s attention without screaming. They’ve been tested by a mom of a child with high-functioning autism, a mom of two very energetic young boys—me! Turn off electronics: More than likely your child’s attention will improve greatly when you ask him to turn off the TV or video game while you ask him a question. Make noise: Clap a pattern or use a whistle or some other noisemaker. Whisper: Sometimes when I feel myself getting very angry I choose to whisper to calm myself and get my son’s attention at the same time. I bend down so I’m more on his level and whisper in his ear. It works! Use sing song tones: My son with Asperger’s syndrome sometimes tunes out the whole world. He also doesn’t prefer singing most days. I’ve learned when I use a sing song voice he often pays attention more quickly because he wants it to stop. Be silly: Being silly gets your child’s attention and also breaks up tension if it’s been a rough day. Get physical: In my home, boys have LOTS of energy and need to get it out. If you have the time, give your child something physical to do first, then have your discussion or give the directions. The physical activity will help him pay attention better afterward. It doesn’t have to be a lot—say twenty jumping jacks or run around the table five times. Speak in funny voices: Again, one way to break into your child’s ability to tune out the world is to sound different. Sometimes I cup my hands around my mouth and talk in a silly robotic-sounding voice. Incorporate sign language: When my boys were young they learned some sign language before they could talk. The sign for “no” has come in handy out in public and across a busy room. Instead of yelling or embarrassing my child by calling attention to an inappropriate behavior, I just catch his eye and sign “no”. Utilize a timer: Does your child get engrossed in a project and it’s hard to pull her out? Instead of repeating yourself five times and letting your blood pressure rise, let the timer be your police! Go over, tell your child, “In five minutes Mommy needs to talk to you.” Then set the timer and let the beeping or buzzing be an audio cue. Warning: The timer is for you, too. Don’t ignore it and put off your child. That sabotages the tool. Wait: If you’ve been talking to your child and you can tell she’s not listening, stop talking. Wait until she notices the silence and looks up to see why you stopped. Of course we all still have times when we lose it. Hopefully these ten tips will help you feel like Charlie Brown’s teacher less often and bring a bit of calm to your home. Do you have other things that have worked for you? I’d love to hear about them! As the Public Relations manager for Home Educating Family, Jenny Herman enjoys interacting with homeschoolers through HEDUA’s social media and her special needs column in their magazine. She and her husband Greg are learning to view life through the eyes of their sons—one with an Autism Spectrum disorder and one with a propensity for pretending. You’ll find lots of interesting stories about finding grace in autism over at her blog, ManyHatsMommy.com. Great tips. My favorite is – by paying attention to them when they are speaking to me or walking around our home. That’s a good one too, Rebecca. Thanks for sharing! How to get your kids attention without yelling…. If i may, i would like to add to this… Along with removing distractions,and bringing your face down to their level,i ask for them to look me in the eyes, repeat what i said,and explain their understanding of what i said. I do this so i am certain they truly are paying attention,and there can be no confusion or frustration on either persons part. approaching post. Thank you a million and please continue the rewarding work.